It has resolved multiple issues by alleviating the optimization of an eCommerce website. Everything is been taken as prior to page traffic, duplicate content, indexing etc. Everything can be managed for a website when it is developed in Magento. Magento helps cart to develop for customers so that it will be easy for them to follow the step by step process for purchasing their willing product. The platform gives you the option to choose that thirty payment gateways to integrate from for your eCommerce website. Magento has bought a huge change over development and establishment by fulfilling branding experience for consumers, who choose their smartphones as a price for navigating a website. It has made easier to access in mobile to by connecting anytime and anywhere. When it comes to taking the online market globally, the priorities are always for languages and currencies these two factors are very vital to understand the global audience. Magento has taken steps towards these features which will help any product to reach out any corner of the world. Magento as an eCommerce website development platform has bought various tools and technologies to boost their business. The theory says that more potential buyers can be attracted by branding as alleviate by Magento. This tool helps you will many options like Multi-tier pricing, bundled product, landing page too, private sales etc. The above are the vital benefits which have bought huge change in the market and even you will find in the info-graph about the overall market benefit of Magento. The worldwide online commerce sales are growing rapidly through the Magento platform. It is because of its features, flexibility, and functionality. The theory of this rapid growth is the market and easy to use functions from both ends users and customers, so it has been demanding in the market. Every year the online shoppers are been served by Magento merchants which keep increasing always and though the predictions are that it will increase by nearly 20% in the worldwide digital market of demanding Magento. According to the market research, Magento is used all over the world. Most of the users are from the US, UK, Netherland, and Germany. You can even see on the infographic for more details about the countries about the countries where Magento is highly used for developing an eCommerce online store. There are many platforms from which you can choose from but though most of the user has gone for Magento development. 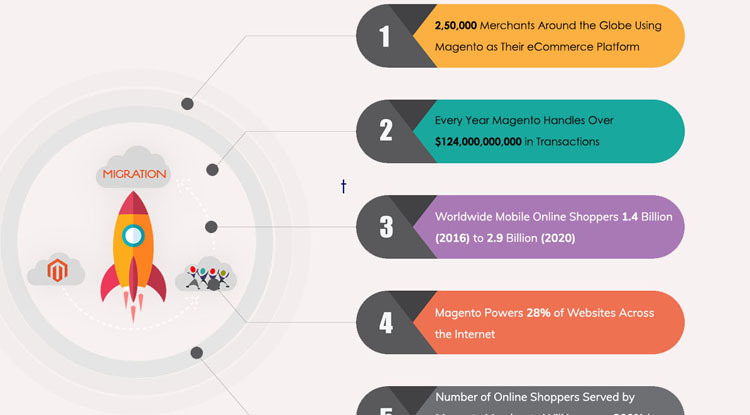 Even as you can see in the info-graph that Magento has been in demand of 26% as compared to other platform and is been famous because of its features in the global markets. Magento is very popular in the market that currently most of the website is developed for online shopping and it is being in very high demand for businesses and industries. Magento has bought huge change in the world of online eCommerce market. You will find more in details about website verticals and the brands who prefer Magento as their priorities on their business. Magento is one of the platforms where everything is served with the best and all the services which are been provided to a customer by considering their priorities. Every single step is hard in the beginning for Magento but now the new upgrade has made the platform more comfortable and easy to use.